The future of the 45,000MW Illinois power market has been in the news the last few months. Electricity generators Exelon (NYSE:EXC) and Dynegy (NYSE:DYN) claim major changes are needed or else they will be forced to close money-losing plants. The dramatic drop in natural gas prices and Illinois’ unique market environment are two big reasons behind these closure threats. Except for the area around Chicago (managed by PJM), the electricity grid in Illinois is managed by the Midcontinent Independent System Operator (MISO). MISO manages a giant area spreading from eastern Montana down to Louisiana and eastern Texas. However, in all of this territory, only Illinois has unregulated electricity markets. As discussed previously (https://www.entelligent.com/news/2015/12/08/dynegy-s-proposed-shutdown-of-the-wood-river-power-plant-robert-howard/) this creates a problem in MISO’s capacity auction. Regulated utilities, with plants that are assured full price recovery, have an advantage over Illinois-based unregulated plants. Improvements in the Illinois transmission system have made the situation worse. Last year’s capacity auction allowed 3,130MW of imports to meet southern Illinois reliability requirements, while this year 6,425MW of imports were allowed. The change contributed to an auction clearing price of $72/MW-day, which was about half of last year’s level. None of the 2,197MW Dynegy offered into the auction cleared. Exelon stated that while their Clinton nuclear plant cleared the auction, the price was still too low to make it profitable. At first glance it appears that utility customers in other states are subsidizing the cost of electricity for Illinois consumers, and that Illinois would be a net beneficiary from this situation. However, since the Illinois plants have to be profitable to remain open, this situation eventually will lead to plant closures in the state. Closures mean lost jobs and tax revenue, and potentially lower reliability. While MISO currently has enough capacity to meet forecasted demand, the future is not as clear. Exhibit 1 comes from the North American Electric Reliability Corporation’s 2015 Long-Term Reliability Assessment. 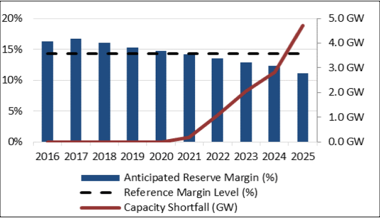 Forecasts show MISO’s reserve margin declining below their 14.3 percent target minimum in 2021. Since Illinois is depending on imports from the rest of MISO to meet demand peaks, and MISO is facing a potential shortfall in a few years, it follows that Illinois will be the region put most at risk by the deficit. The path to a shortfall continued in May when Dynegy announced plans to mothball 1,835MW of coal capacity at their Baldwin and Newton plants. This was on top of last October’s announced closure of 465MW of coal capacity at their Wood River plant. In June Exelon announced the closure of two nuclear plants, with 1,069MW Clinton and 1,871MW Quad Cities (located in the PJM grid) as the victims. Exhibit 2 shows that the marginal cost of running these plants is low compared to the rest of Illinois. Even with their low operating costs, power price declines over the last few years have left these plants operating at a loss. Exelon claims that Quad Cities and Clinton have sustained $800M in pre-tax cash flow losses since 2009. The losses have occurred with the two plants running at capacity factors over 90 percent. While these plants are among the first to be dispatched, today’s low power prices do not come close to covering their high fixed costs. Capacity auctions are meant to help cover the gap, but results in both the PJM and MISO capacity auctions have not been enough to keep the plants viable. These closures will have a significant impact on power generation in Illinois. 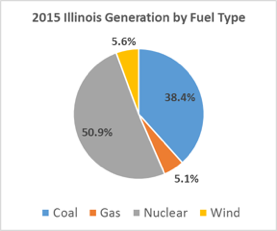 In 2015 over 50 percent of the electricity generated in Illinois came from carbon-free nuclear, as shown in Exhibit 3. About a quarter of the nuclear power generated in 2015, over 24,000 GWh worth, came from Clinton and Quad Cities. Dynegy’s closing plants produced over 12,000 GWh of electricity in 2015. Illinois actually exports a large amount of its electricity production so it is possible these closed plants will just be replaced by out of state sources. 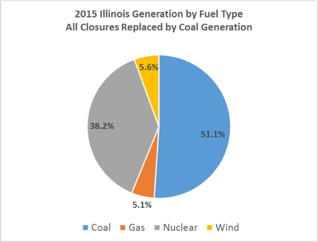 If that happens the nuclear portion of the Illinois generation mix falls to about 47 percent of the total, and coal rises to just under 40 percent as shown in Exhibit 4. 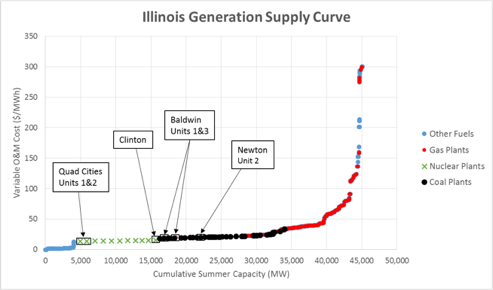 However, the Illinois supply curve is relatively flat, so much of the power might be replaced by in-state supplies. The remaining nuclear plants in Illinois already have load factors over 90 percent, so the replacement generation is unlikely to come from those plants. The lower cost plants on the supply curve are primarily powered by renewable resources, and won’t be able to increase their production. Illinois has limited low-cost gas plant capacity, so replacement power will likely come from coal. Exhibit 5 shows the state’s generation mix if all the replacement power comes from coal. For the remaining Illinois coal plants to generate this amount of electricity they would have to run at an 83 percent capacity factor. This is a high, though not impossible rate. The Exelon nuclear closures might actually lead Dynegy to reverse its mothballing decision. If Dynegy’s plants remain open, the capacity factor for all Illinois coal plants to replace the closing nuclear generation would be 71 percent. The nuclear plant closure will also make it more difficult for Illinois to meet their target for the EPA’s Clean Power Plan (CPP). The Illinois CPP target C02 rate is 1,245 lbs/Net MWh. In 2012 Illinois emitted 2,208 lbs/Net MWh, which already included the benefit of carbon free power from Clinton and Quad Cities. Exelon had proposed legislative changes in Illinois providing credits to non-carbon emitting plants. In theory these changes would have been enough to keep Clinton and Quad Cities open and supported Illinois meeting the CPP goals. The proposal went nowhere before the legislative session ended in May, so Exelon decided to close the plants. Now that people know the closing of nuclear plants is not an idle threat, perhaps there will be more future support. Dynegy also attempted a legislative fix, proposing that the southern half of Illinois join the Chicago area as members of the PJM system. Joining PJM would level the playing field, and might be enough to avoid a permanent shutdown of Dynegy’s mothballed plants. Still, the Quad Cities plant is already in PJM and is closing, so this likely wouldn’t do much to help Illinois’ CPP problem. Exelon (NYSE:EXC) will have four nuclear plants in Illinois after the announced closures are complete. These plants generated over 73,000 GWh of electricity in 2015, so changes to the Illinois market have a meaningful impact on the company’s performance. Exelon will benefit from changes to support the state’s carbon goals and changes to improve the state’s reliability. Dynegy (NYSE:DYN) could benefit from Exelon’s nuclear closures. Their remaining plants will now be better positioned in the supply curve, and should run more often and receive higher prices. Expect to see Dynegy continue to push for market reforms that will improve plant profitability. 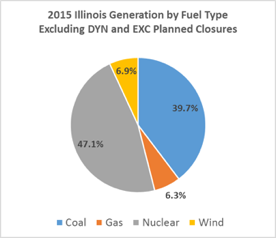 However, since all of Dynegy’s Illinois generation is primarily coal based, new rules supporting non-carbon generation could be a negative for them. NRG Energy (NYSE:NRG) also has significant exposure to these issues. Their Illinois operations haven’t been in the news as much as DYN’s and EXC’s, but they are one of the biggest electricity producers in the state. All of NRG’s Illinois generation is located in PJM, so if Illinois were to move completely to PJM this would mean more direct competition against Dynegy. Their plants are at a similar position along the supply curve as DYN’s, and they should benefit from Exelon closing Clinton and Quad Cities. NRG’s plants are primarily coal based, so any changes in the state’s carbon rules would likely be a negative for their units. They already have plans to shift one of their coal plants to gas, and more rule changes might lead to further retrofits.